Many generations ago, it was tradition for a Wookie to shave as part of the rites of passage into adulthood. To be shaven was to show that one had the strength and courage to face the elements and overcome adversity without the protection of one's fur. However, the tradition came to an abrupt end with the Imperial enslavement of Wookies and the ensuing war effort against the Imperials. The tradition would become part of the folklore which was passed down from one generation to the next. During the time between the second and third Sith Wars of RASSM, a warlord enslaved a group of Wookies and in an attempt to completely break their will, the warlord ordered they be shaved. As they were being shaved, the Wookies remembered the stories told to them by their great-grandfathers or grandfathers and suddenly they felt a bond with their ancestors that they had never felt before. Their resolve and the bond between them was stronger than it had been since their capture. It was no longer a matter of if they would escape, but merely a matter of when would they escape. A few days later, the Shaven Wookies made their coup attempt and took control of the warlord's flagship in a matter of hours. After gaining control of the flagship, the Shaven Wookies contacted a passing ship from the Tenasi System and requested assistance in getting back to Kashyyyk. Before leaving the flagship, the Shaven Wookies dismantled the flagship's engines as well as its communications system. Once aboard the ship from Tenasi, the nearest planetary authorities were informed of the location of the warlord's ship and his practices. A hero's celebration welcomed the Shaven Wookies upon their return to Kashyyyk. After the elders heard about what the Shaven Wookies had overcome, they unanimously agreed to reinstate the tradition of shaving as part of the rites of passage into adulthood. The Shaven Wookies vowed to remain furless in honor of all the Wookies who had taken part in the great tradition of shaving. The individuals from Tenasi became part of the honor families of the Shaven Wookies. A few of the Shaven Wookies decided to go with the individuals from Tenasi to serve as bodyguards, one of the individuals took an oath to protect the Shaven Wookies and he became known as the Keeper of the Shaven Wookies. 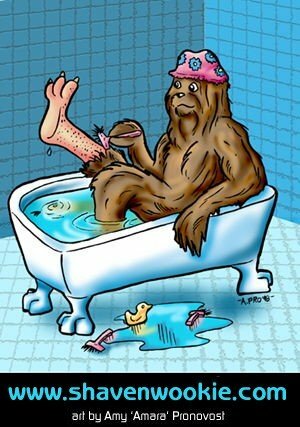 Remember, you haven't shaved until you've shaved a wookie.